With berthing prices going up and race crews hard to find, there’s increasing interest in smaller boats that need fewer people to handle them – the new Beneteau First 35 is one such yacht. 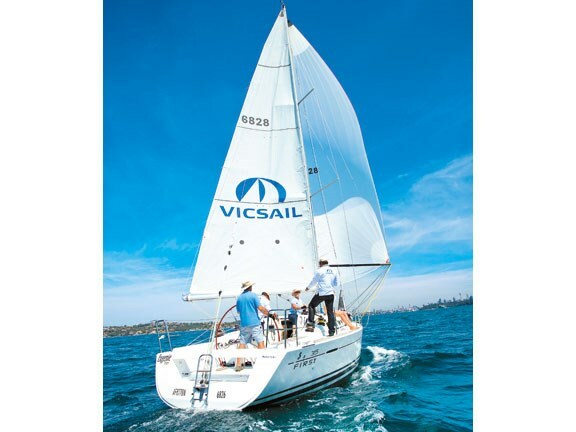 With option-up cruising sails, mainsail bag with lazy jacks, a furler for the non-overlapping headsail, smaller steering wheel and an autopilot on the base boat, the First 35 becomes a cinch for two people to cruise and twilight race. Add the call up racing sails, the symmetrical spinnaker kit and jib barber haulers and you have a handy IRC or PHRS club racer package. Additional gear in the options list includes 1.8m shallow-draft keel, power windlass and spray dodger – or 2.2m deep keel, rod rigging with carbon backstay, carbon mast, solid vang and bigger winches. The hull design mirrors the First 40’s, but with shorter, flat mid-sections and without the stern-section chines. Beneteau has chosen monolithic polyester-resin hull construction, with an FRP/balsa sandwich deck. An inner moulding formed from unidirectional fabric is bonded to the hull and absorbs stresses at pressure points. The deck-hull joint is mechanically fastened and bonded with polyurethane adhesive, and topped with a teak bulwark. The shallow-draft keel is cast iron, with sweptback bulb, and the deep-draft version is a cast iron foil and T-shaped bulb. Both First 35 keels attach to the hull via bolts and a stainless steel plate. The standard rig has an aluminium, keel-stepped mast with twin, sweptback spreaders and an aluminium boom with block and tackle vang, Dyform wire shrouds and foil-fitted forestay, and tackle-adjustable carbon backstay. The Regatta Pack’s optional shrouds and forestay are rod, and the kit also includes a strut vang, carbon spinnaker pole, jib barber haulers and a Windex. A top-level race stage adds a carbon mast and matching black paint on the aluminium boom. The cockpit is a shortened version of the First 40’s. The aft section is dominated by a 1600mm-diameter, leather-covered wheel with flip-up panel over the rudder post’s emergency tiller socket, teak-topped helm benches and a life raft locker under the floor. A removable transom beam is an option. A sole-mounted mainsheet track runs in front of the wheel pedestal and the German mainsheet systems feeds coaming-mounted Harken 46.2 STA winches that are close to the wheel, allowing the helmsperson to double as mainsheet hand more easily. Compared to the 40, the cockpit is shorter, but the First 35’s fore and aft sail-plan is only 70% of the 40’s and its spinnaker is 30% smaller, so there’s not the need for so many hands. The sheet winches are 46.2 STAs. The running rigging layout features Dyneema sail control lines running through turning blocks, back to cabin-top clutches and a pair of 40.2 STA halyard winches. The lines run in two deck recesses, but are not hidden under the cabin top for easier reeving. Single-line reefing can be done from the cockpit. The distinctive First "eyebrow" cabin window design provides additional deck-grip area on the cabin top, without restricting port size. The opening cabin ports are the same as those fitted to the 40, as is the saloon hatch. Up forward, the First 35 loses the three-hatch cabin top, but the vee-berth hatch is big enough to allow sail handling. The saloon is almost identical to the First 40. 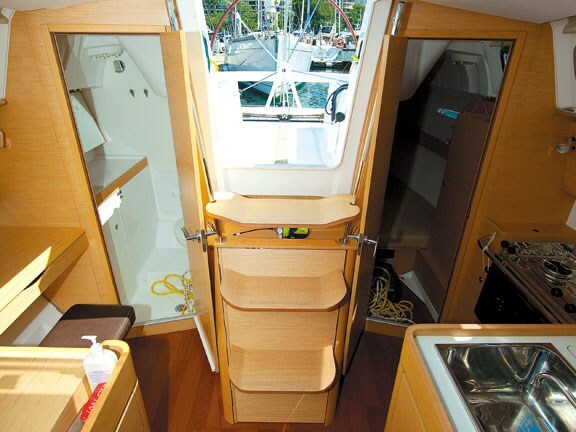 The companionway has a lipped entrance and there’s a flip-up, hinged Perspex panel as well. Broad steps with anti-slip treads lead to an airy saloon that’s LED-lit and ventilated by a roof hatch over the dining table and six opening ports. Pale oak timber trim is standard. The dinette seats six and the drop-side table can be raised for dining, or dropped to coffee-table height. There’s a stainless steel, grip-finished handrail running along each side of the saloon, at the deck and coach house meeting points. The two-cabin First 35 has a slightly larger vee-berth and an aft king-size cabin. In the 35, the 40’s starboard aft cabin becomes a roomy head/shower with 80lt holding tank, while aft of the head is a large sail bin with cockpit access. An L-shaped galley is to port of the companionway. There’s a deep sink with freshwater mixer tap and a seawater floor pump/icebox drain. The gimbaled cooker has two burners and an oven. Beside the sink is the lid of the 100lt icebox that can be optioned as a 12V fridge/freezer. To starboard of the companionway is a chart table area with foldable navigator’s seat and swing-out electrical panel. 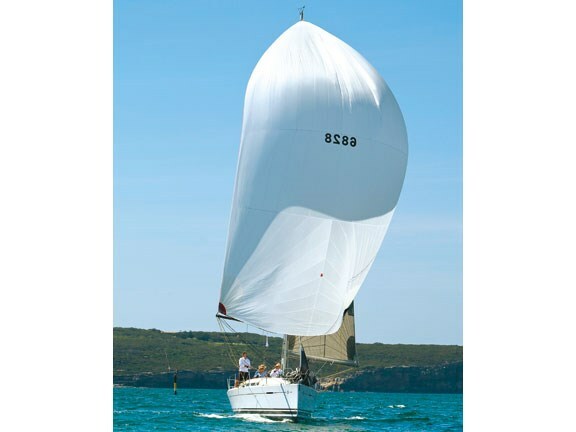 Eugenie has been stacked with Ian Short carbon/taffeta sails – three jibs and a main – and two symmetrical spinnakers. A light helm, no prop walk and good vision from the steering station made tight manoeuvring easy. 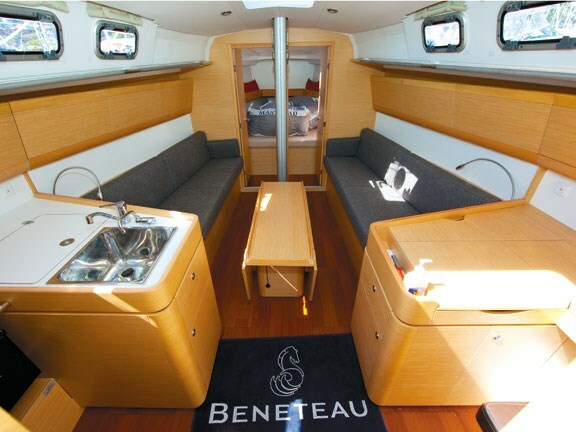 Beneteau has cleared the cockpit of rope catchers, the manual bilge pump folds flush, and the engine control lever is detachable. The main was more cambered at the leading edge than I expected, so we fiddled with outhaul and backstay tensions – easily achieved with multi-purchase tackle – and the jib barber haulers, to flatten the sails for upwind work. Traveller and backstay cleats are on both sides of the cockpit. Sitting on the windward cockpit coaming there was clear view of the jib tufts. Shorthanded, it’s possible for the helmsperson to sit forward of the wheel and play the mainsheet winch as well. In this balmy breeze the new First 35 was livelier than the 40. Acceleration out of puffs was dinghy-like and the 35 cut through small chop without slapping its forward sections. We saw 6.4kts at around 30degrees and it was possible to use the big wheel rim precisely as a tiller, for minute direction changes to counter waves and chase slight wind shifts. It’s a cable-quadrant steering system, but the cable length is short, so there’s no evidence of slack. Setting the light-weather masthead kite we soon had the boat at wind speed and I was impressed with the steering precision when running. The gear is well organised for rapid downwind direction changes. 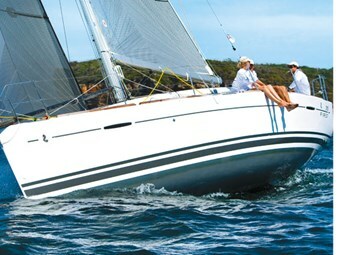 See used Beneteau boats for sale.